Japan's cabinet has approved a new national security strategy and increased defence spending in a move widely seen as aimed at China. Over the next five years, Japan will buy hardware including drones, stealth aircraft and amphibious vehicles. For a country that, according to its constitution, does not maintain any army, navy or air force, Japan spends an awful lot of money on defence. Of course, Japan does have a military, a large and modern one. But it was designed in the days of the Cold War to protect Japan against an invasion from the north, from Russia. But over the last 10 years, China has transformed its military at an astonishing rate. Then last year, a long simmering dispute over a tiny group of islands in the east China suddenly burst on to the front pages. Last December, Japan elected as prime minister an avowed nationalist, Shinzo Abe, who promised he would not be pushed around by Beijing anymore. So what, you may ask. Any responsible government needs to plan its defence policy based on present and future threats. From that point of view, what Mr Abe is doing is only sensible and responsible. 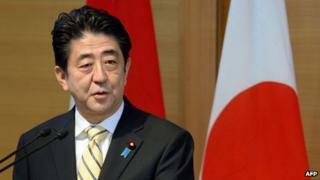 However, there are many in Japan who suspect Mr Abe of having another agenda. It reflects concern over China's growing assertiveness over its territorial claims and Beijing's mounting defence spending. "China's stance toward other countries and military moves, coupled with a lack of transparency regarding its military and national security policies, represent a concern to Japan and the wider international community and require close watch," the national security document said. Prime Minister Shinzo Abe, who was elected a year ago, has called for Japan to broaden the scope of activities performed by its military - something currently tightly controlled by the post-war constitution. Approving the national security strategy made Japan's foreign and security policy "clear and transparent - for both the Japanese people and all the world to see", he said. Spending over the five years is expected to amount to 23.97 trillion yen ($232bn, £142bn), a rise of 2.6% once billions of yen in cost savings are taken into account. Japan plans to buy anti-missile destroyers, submarines, 52 amphibious vehicles, surveillance drones, US fighter planes and 17 Boeing Osprey aircraft, capable of vertical take-off. America currently guarantees Japan's defence, with a nuclear powered aircraft carrier and 50,000 troops stationed there. The announcement of more Japanese military spending comes weeks after China established an air defence identification zone (ADIZ) over a swathe of the East China Sea, including islands controlled by Japan. It says all aircraft transiting the zone must obey certain rules, such as filing flight plans, or face "measures". Japan, US and South Korea - which claims a rock that lies within China's declared zone - have strongly criticised the move, with the US calling it "an attempt to unilaterally change the status quo" in the region. In its latest expression of concern, the US has warned China against establishing another ADIZ over the South China Sea. Speaking at a news conference in the Philippines, Secretary of State John Kerry said the East China Sea zone should not be implemented and "China should refrain from taking similar, unilateral actions elsewhere in the region and in particular, over the South China Sea." China had already criticised the outlines of Japan's defence policy and says it is "closely watching Japan's security strategy and policy direction". "Japan's unreasonable criticism of China's normal maritime activities and its hyping up of the China threat has hidden political motives," Foreign Ministry spokesman Hong Lei said. Japan ranks fifth in the world for military spending, according to the Stockholm International Peace Research Institute, while China is in second place behind the United States. Mr Abe's government says the strategy is a measured and logical response to a real and increasing threat, reports the BBC's Rupert Wingfield-Hayes in Tokyo. But many on the left in Japan think Mr Abe is using the threat from China to pursue his own nationalist dreams, our correspondent adds.